DT-SENSE Ultrasonic Ranger (USR) is a distance measuring module is non-contact so easily connected with a variety of microcontroller-based systems. The process triggers (trigger) and read the measurement data with the DT-SENSE Ultrasonic Ranger only need 1 piece pin microcontroller. Examples of the use of DT-SENSE Ultrasonic Ranger is for intelligent robot, smart vehicle, automatic doors, security systems, distance measuring objects, and so forth. Distance range: 2 cm to 3 m.
Burst Frequency: 40 kHz - 16 Vpp signal box. No dead zone (no blank spots between 2 cm to 3 m.
Having interface Pulse Width / Pulse Width. Readings can be done every 25 ms (40 Hz rate). Trigger Input: TTL negative pulse, 20 us (at least). There are LED indicators that show activity sensor. Requires no delay before the next measurement. There is an example program using C language for microcontroller AVR AT90S2313 and language BASIC for the MCS-51 microcontroller. Requires 5 VDC voltage source. Current consumption of around 17 mA (typical). 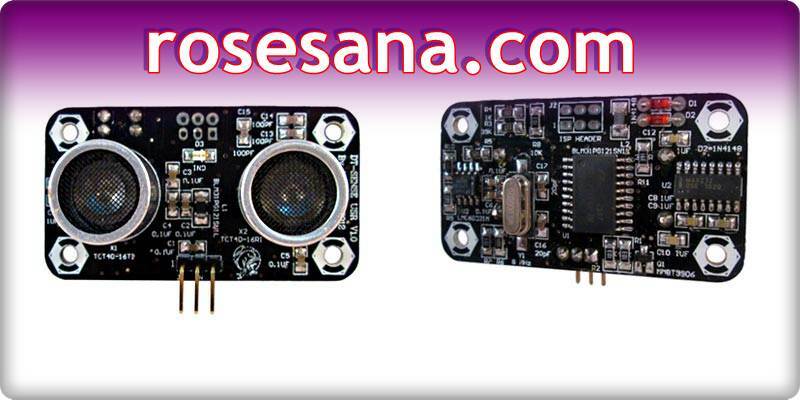 1 piece DT-SENSE Ultrasonic Ranger (USR).